Slugterra is an epic sci-fi comedy adventure set deep underground, where the ammo’s alive and only the quick survive! In this luminous, high-tech, underground world, every cavern holds a new adventure, a new battle and weird little slugs to be discovered. In this collection, join our hero Eli Shane, his gang of slugslingers, and his best slug buddy Burpy on their numerous adventures. Whether they are thwarting a mad scientist, facing an Ice Ogre or questing after fabled treasure, Eli and the rest of Shane Gang prove they are ready to slug it out! Now available on DVD for retail price of $14.97. The kids have become huge fans of the gang from Slugterra and love having the DVDs on hand to watch any time. Not only a great story line for little ones, adults can enjoy this series as well. It's action packed that also includes having some humor that the entire family can enjoy. Each episode will have you loving the slugs a bit more. My kids already have their favorite and love to see them in action. Heroes of The Underground is now out on DVD today, March 4th and the DVD includes five episodes from the show and bonus features of teaching your little ones how to draw a slug! My daughter really loved this feature. She's big on drawing. 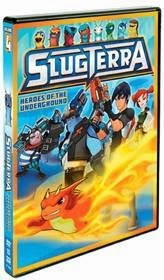 To find out more information on where to purchase Slugterra Heroes of The Underground be sure to check out www.shoutfactory.com. Disclosure: All opinions are my own. I received Slugterra Heroes Of The Underground on DVD at no cost for the purpose of this review. No other compensation was received.